"Capturing the memory of long walks through the spice markets of Damascus, L’Autre is a dry, sensual blend that recreates all the mesmerizing magic found in the rich landscape of the Orient," says Diptyque of its second perfume, released in 1973. I associate the name L'Autre* (The Other) — given the supposed fragrance inspiration — as representing separateness: a tourist surrounded by new sights and sounds and smells and regarding himself or those around him as The Other. "Autre" in my French dictionary takes up half a page, so interpretations may vary! Certainly given L'Autre's bold nature, many smelling it, including perfume lovers, may recoil and feel L'Autre is The Other (so weird and un-perfumelike as to be unwearable). L'Autre is an angular fragrance; as I smell it my nose is 'jolted.' L'Autre does not provide a smooth ride; there are strident bits, silky strands, talcy sprinkles and funky oiliness as the perfume develops. And by the way, my review is based on a brand-new bottle of L'Autre; not vintage L'Autre. L'Autre begins with a powerful blast of lemon-y spice notes (or spiced lemon notes? ): coriander seeds, cardamom and CUMIN. If you sample fragrances on a paper strip, do not trust the strip in the case of L'Autre. The strip will amplify the cumin; on skin L'Autre is complex. A few minutes into the perfume the cumin calms (only somewhat) and what I smell reminds me of the aromas in a jar of my homemade lime pickle (which contains ginger, cloves, mustard seeds and oil, coriander, cumin, cayenne powder — and other ingredients that must remain secret so I can continue to bribe friends with my limited supply of jars). A surprising vinegar note appears just before the base notes start percolating. You may get hungry as you wear L'Autre. L'Autre's base starts with toasted spice aromas, dry, almost dusty (accent on coriander and cumin). It was at this stage I longed for a strong black tea note to join the proceedings (maybe all the "food" made me thirsty). L'Autre's extreme dry down smells of musky, leather-infused, sugar-free amber. Many may ask: "Do I want to smell like I've been sweating over a hot stove tempering spices and making a feast?" To me, the chef in that scenario would be male; L'Autre smells very masculine. I'm curious if any women reading this post wear L'Autre...if so, please comment. I like L'Autre and am I happy Diptyque keeps it in production. 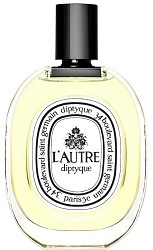 As often happens with me and food-y perfumes, I'd prefer L'Autre as a candle — I could turn it "on" and "off" at will. I got my L'Autre sample at the jewel-box Diptyque store in San Francisco; the staff was gracious, generous and knowledgeable. The boutique stocks the entire Diptyque "catalogue." 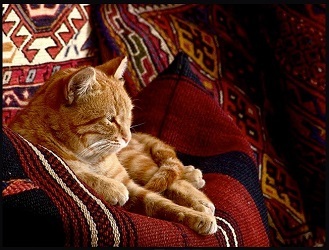 To illustrate this post I've chosen the image of a regal tom cat resting on a carpet in Damascus in 2008; he appears to have the character of L'Autre: piquant and pert. Diptyque L'Autre Eau de Toilette is $130 for 100 ml. For buying information, see the listing for Diptyque under Perfume Houses. * Listed notes of coriander, cardamom and patchouli. Note: top image is damascene indulgence by Hussein Alazaat at flickr; some rights reserved. Sigh. I was enjoying your review, as much as I doubt I would enjoy the perfume. . . . until your description of the ginger tom in Damascus in 2008. Since I’m an atheist, in lieu of a prayer I went and petted my own tom tabby and hoped/hope fervently for peace for that big orange feline and all the folks in that great city. OF: and what a gorgeous city, too. If the tom lived in the antiques quarter (and was as pampered as he looks) he may well have survived. As much as I appreciate Volutes and the Essences Insensees mimosa, I really miss the old Diptyque, every scent as full of character as an antique carpet. I think l’Autre was a bit much for my skin, but you’ve reminded me that I do own and love Virgilio, and now is its season. Noz: I loved smelling all the “oldies” in the SF boutique. Eau Lente! I even bought a bottle of L’eau Trois. I have Eau Lente and l’eau Trois, too. Nothing else like them! Well, not exactly: a few of the SNMs, like Pot-Pourri and Nostalgia, also have a lot of character. Noz: mine, too…Diptyque and Hermes I think have gotten the most of my money over the years. I love both Diptyque (old and new) AND cumin so I will definitely give this a try! nicolasix: I think you might like it! That is a lovely little store, isn’t it? Calling it a jewel-box is a great description!! I have not been there in way too long. sunnlitt: I’ll definitely pop in whenever I go to SF…I should have gotten a candle while I was at it. Thanks for the nice review of an old favorite! I am a woman who wears L’Autre, but not very often. It’s so interesting and so compelling…AND so unusual that it’s not a throw-on-and-go scent. To be honest, sometimes I wear it when I’m feeling at odds with the general public and want to signal that I’m not some anodyne floral person. I loved wearing it when I lived in SE Asia. Where the air was full of scents of spice and sweaty humanity, it was fun to play with the dissonance of being a middle aged white lady sitting quietly on the train smelling like curry. I have a vintage bottle and offered decants in the recent Swapmeet. No takers (no surprise!) but the offer still stands for anyone more interested having read this review. Thanks, Millicent! Have you compared your vintage to the new version? Not yet, but you’ve inspired me! Millicent: come back and “report” when you do…no matter how long it takes!